Everyone has old, well loved tanks in their basement or know someone who does. 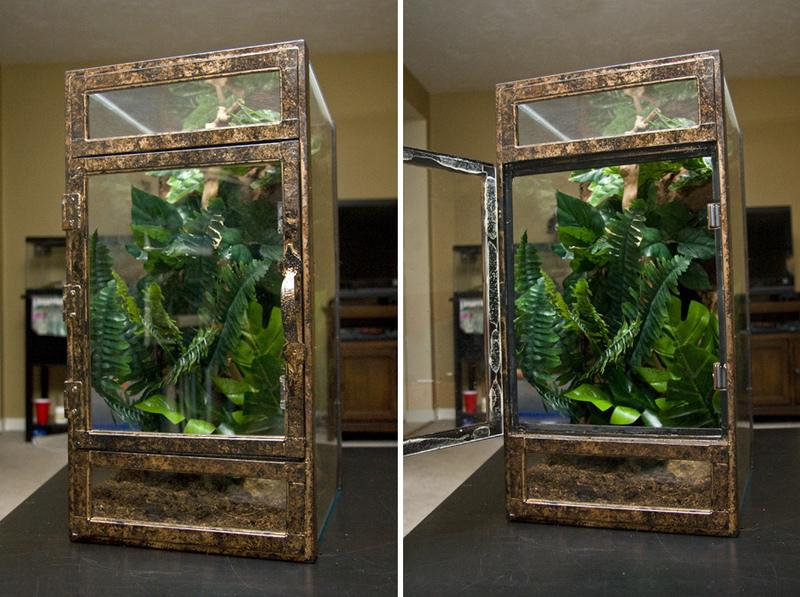 I wanted to document a “basement special” 10 gallon tank conversion from start to finish. This beloved tank is about 20 years old and needed some TLC. Here’s the build! 1) Get the black Great Stuff if you can. If you can’t, no worries but if you get the black colored one, you don’t need to paint it. Faster projects are awesome. 2) If you live in a humid place, make the big door out of screen. Mine where holding way too much water and molding. 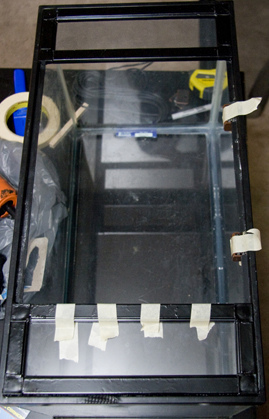 Measure the inside dimensions of the lid of your tank. Cut two pieces of plexi. 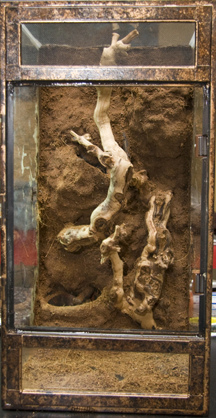 One piece is short in height and is just there to hold the substrate. The other piece is for the door. 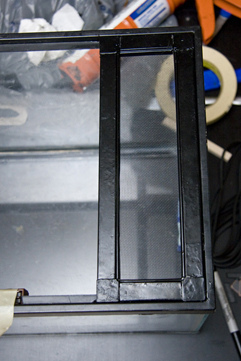 Use silicon to glue the tiny piece of plexi to the bottom of the lid. 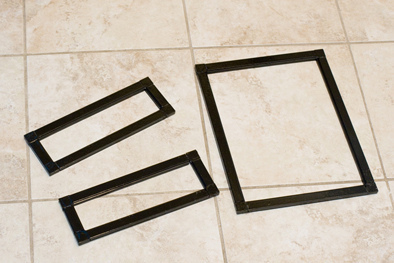 Cut the metal screen framing in order to make 3 “frames” Once frame is just there for “looks”. 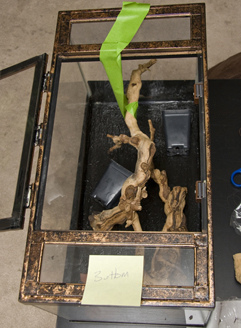 It will be placed over the bottom piece of plexi that holds in the substrate. 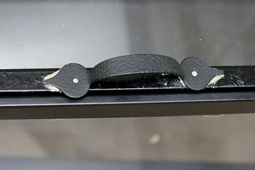 The 2nd frame will cover the door. The last frame will actually get screen put into it. This frame goes at the top of the tank. Make sure you leave room for the plastic corner pieces. I spray painted the frame black too. 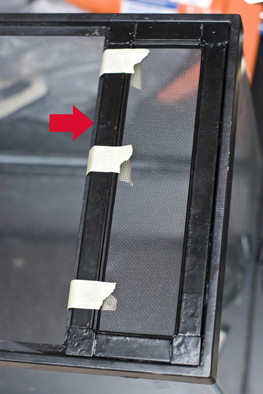 Use silicon to glue the fake frame over the little bottom piece of plexi. 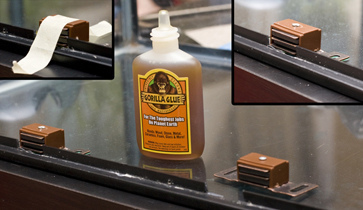 Use gorilla glue to glue the plexi to the back of the frame for the door. (I tried silicon in round one and it wasn’t string enough). Add the screen to the last frame. 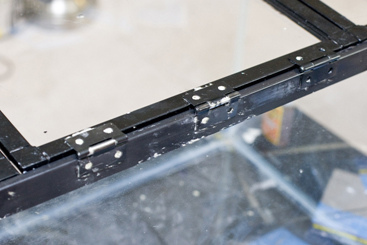 Use silicon to glue the frame with the screen onto the lid. Using the wire cutters, cut 2 gaps into the lid so the magnets have a place to sit. Gorilla glue the magnets into place. (I needed to bend the metal “feet” of the magnets flat with some pliers.) Gorilla glue the metal pieces (that come w/ the magnets) to the door. Then, tape it all up and let it dry. Gorilla glue the hinges and handle on. 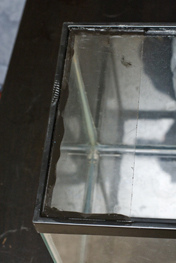 Silicon in the 2 pieces of balsa wood (painted with black acrylic paint, and cut to size) to the under side of the tank lid and flush to the bottom frame and the top frame. This is so the door has a place to sit. I smeared some silicon on the top of the wood as well to help water proof. Since this tank was so well loved, I thought it needed a make over. I taped it off and added some copper spray paint. 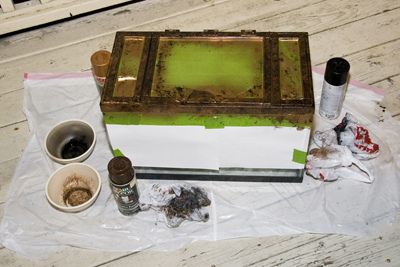 Then I used a plastic bag and some black spray paint to make a broken pattern. I was hoping to hide imperfections in the original lid. Time to make it pretty! Add the black silicon to the back of the tank. 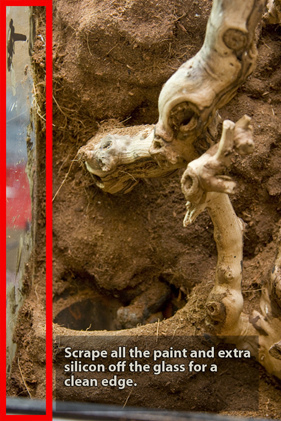 Place pots for plants and branches where you like them. I used all fake plants but I still like having pots in there so I can have a place to anchor them. 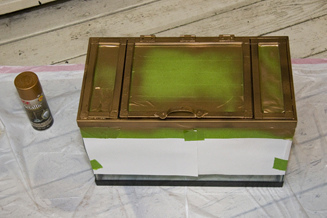 Spray in the great stuff, wait for it to dry, and then paint it brown. 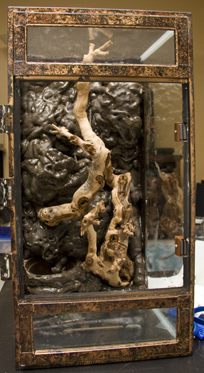 Painting it brown helps hide imperfections in the coco fiber layer. Smear silicon all over the painted great stuff. Add the coco to the silicon and pat it down pretty hard. Let it all dry and then clean up the edges. Add fake plants and enjoy!